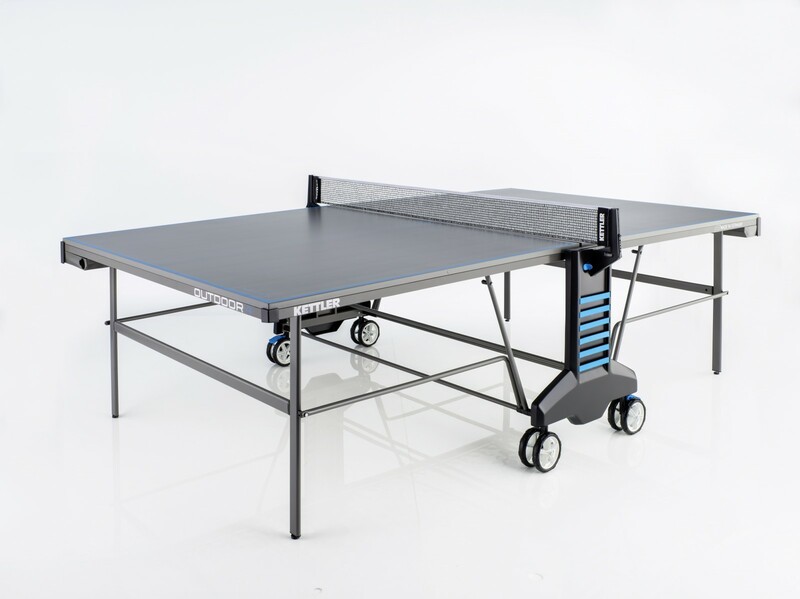 Due to many practical detail solutions, the Kettler table tennis table Outdoor 4 is a good starter table and offers fun for the whole family. The Kettler table tennis table Outdoor 4 is ideal for your garden and the whole family. The practical storage compartment for up to 10 balls facilitates the play and reduces the time between the individual rallies. A practical innovation is the easy-to-mount edge protection, protecting from bruises and injuries mainly when running around. The storage straps offer space for bats and drinking bottles so you have necessary things at hand. New offroad double wheels offer the possibility to move the table tennis table even on uneven and difficult to access floors. Slight unevennesses can be compensated with the height adjustment on all four feet. Sehr gute Tischtennisplatte mit sehr guter Spieleigenschaft. Mit Youtube Video kann man die Platte zu Zweite schnell aufbauen. Die Abwicklung des Kaufs war auch einwandfrei. Ich bin rundum zufrieden. Meiner Meinung nach das beste Preis-Leistungsverhältnis bei Tischtennistischen. Stabiler Tisch, wetterfest und optimale Alu-Tischtennisplatte. Kettler table tennis table Outdoor 4 add to comparison list.